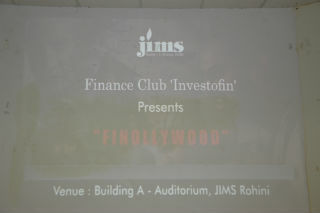 Finollywood-learning finance through movies was conducted by Investofin – the Finance Club of JIMS on Monday, 4th December, 2017. The primary objective for conducting this event was to create awareness that a technical subject like finance can be studied and understood while having fun watching movies. The students were encouraged to come forward and present their creative ideas of learning finance through Hollywood and Bollywood movies. 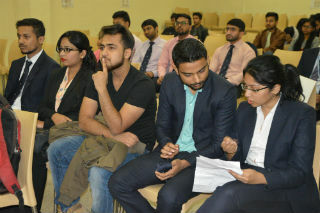 The event got a great response from students. In total, five teams participated in the event. Each team had 4-5 members. In total, 25 students participated in this event. The event began with a welcome note for the faculty members, judges, participants and student audience. 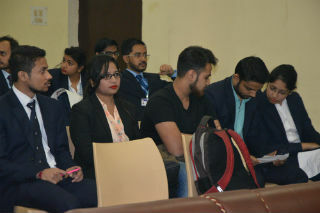 Dr Parminder Bajaj and Mr N P Singh judged the event. Each team picked up a financial concept portrayed in a Hollywood or Bollywood movie and presented in the form of role play and presentations. After every presentation, fillers’ questions were asked to gain the participation of audience. For every correct answer, they were rewarded with N5 masks. This way the event also created awareness among audience about increasing air pollution and precautions they could take to reduce its effects. Judges gave their expert opinion and suggestions to improve to each team. At last, winning teams were declared by the judges. Evaluation done on the basis of their presentations, knowledge and content. Top two performer teams were awarded prizes. Each member of the first winner team was awarded with pen drives whereas members of second winner team were given chocolates. Certificates of appreciation were distributed to all the participants. 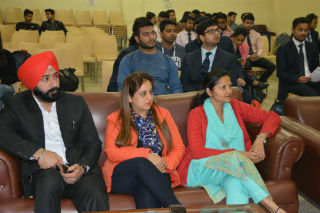 The event was concluded successful with a huge participation of enthusiastic students and support of the club members in successfully organising this event.